Dec. 23 (Bloomberg) -- The Organization of Petroleum Exporting Countries may hold an emergency meeting before its next scheduled meeting in March, Venezuelan Energy Minister Rafael Ramirez said. Ramirez, who was attending a summit of gas-producing nations in Moscow, didn’t say exactly where or when such an oil meeting might take place. Four days ago, OPEC President Chakib Khelil said OPEC may meet in Kuwait City on Jan. 19 to discuss further production cuts, adding that OPEC will continue to reduce supply as demand falls until an “equilibrium” is reached. The potential Kuwait meeting may coincide with a meeting of Middle East leaders in that city, according to Khelil. The oil group’s meeting is currently scheduled for March 15 in Vienna. OPEC decided on Dec. 17 to deepen existing supply cuts, and set a production limit for 11 of its members at 24.845 million barrels a day, which would be 4.2 million barrels a day less than it pumped in September, according to figures published by OPEC. Dec. 23 (Bloomberg) -- Gold prices fell on speculation that a drop in commodity costs will damp demand for precious metals as a hedge against inflation. Silver and platinum also declined. The Reuters/Jefferies CRB Index of 19 raw materials is down for a fifth straight session, heading for the biggest annual decline ever. Crude oil, gasoline, corn, soybeans, wheat and copper have tumbled from records in 2008. Gold has dropped 19 percent from the all-time high of $1,033.90 an ounce in March. Gold futures for February delivery fell $9.10, or 1.1 percent, to $838.10 an ounce on the Comex division of the New York Mercantile Exchange. The price is little changed this year. Silver futures for March delivery slid 60 cents, or 5.5 percent, to $10.26 an ounce on the Comex, the biggest drop since Dec. 1. The most-active contract has fallen 31 percent this year. Platinum futures for April delivery dropped $10.70, or 1.2 percent, to $850.50 an ounce on the Nymex. Palladium for March delivery was little changed at $174.70 an ounce. Gold rallied 31 percent last year as inflation rose at the fastest rate in almost two decades. Consumer prices dropped 1.7 percent in November, the most on record, as energy costs plunged. Crude-oil futures have plummeted 73 percent to less than $40 a barrel in New York from a record $147.27 in July. Still, gold may rebound should a deepening recession boost demand for the metal as a haven, said Tom Pawlicki, an analyst at MF Global Ltd. in Chicago. The U.S. fell into a recession in December 2007, according to the National Bureau of Economic Research in Cambridge, Massachusetts, the arbiter of the country’s business cycles. Platinum may rally should the government’s bailout of General Motors Corp. and Chrysler LLC keep the U.S. auto industry from collapsing. Both platinum and palladium are used in pollution-control devices in cars and trucks. “Platinum is a market based on the health of the auto industry,” Pawlicki said. Platinum has dropped 44 percent this year. The price reached a record $2,308.80 in March. Palladium has plunged 54 percent in 2008. Dec. 24 (Bloomberg) -- Crude oil rose in light holiday trading after dropping yesterday on signs that the economy of the U.S., the world’s biggest oil consumer, may contract further. Crude declined as much as 5.3 percent yesterday, extending its slide from a record $147.27 a barrel in July. The median resale price of homes fell 13 percent, probably the largest drop since the Great Depression, National Association of Realtors Chief Economist Lawrence Yun said in Washington. Oil for February delivery rose 24 cents, or 0.6 percent, to $39.22 a barrel at 10:16 a.m. Sydney time on the New York Mercantile Exchange. Prices are down 59 percent this year. Yesterday, oil fell 93 cents, or 2.3 percent, to close at $38.98 a barrel. Oil for delivery in February 2010 was more than $14 higher than the current month yesterday, a market condition known as contango. The pattern encourages companies to increase supplies. U.S. crude-oil stockpiles probably increased 500,000 barrels in the week ended Dec. 19 from 321.3 million the week before, according to the median of responses in a Bloomberg News survey before an Energy Department report today. It would be the 12th gain in 13 weeks, also an indication that demand is falling. “The strong contango is providing a strong incentive for people to put oil in storage and discourages financial investors that had such a big role in the run-up in prices,” said Guy Caruso, senior adviser with the Energy and National Security programs at the Center for Strategic and International Studies in Washington. The Energy Department is scheduled to release its next inventory report at 10:35 a.m. today in Washington. “We are seeing the reverse of what happened in the first half of 2008, when prices surged,” said Caruso, who was administrator of the Energy Information Administration, the statistical arm of the Energy Department, from 2002 until September. Sales of new homes in the U.S. fell 2.9 percent last month to a 17-year low of 407,000, the Commerce Department said yesterday in Washington. The median sales price declined 11.5 percent from a year earlier to $220,400. “I doubt there will be much strength in the energy markets as long as people are worried about losing their jobs and paying their bills,” McGillian said. The U.S. economy shrank in the third quarter at a 0.5 percent annual rate, the worst since 2001, according to revised figures from the Commerce Department. Prices may be more volatile this week because many traders are taking time off for the Christmas holidays. “Volume is declining by the day,” Barakat said. Volume in electronic trading on the exchange was 232,352 contracts, as of 3:13 p.m. in New York yesterday. Volume totaled 287,570 contracts Dec. 22, down 42 percent from the average over the past 3 months. Open interest Dec. 22 was 1.14 million contracts. The exchange has a one-day delay in reporting open interest and full volume data. The Organization of Petroleum Exporting Countries announced a record production cut last week in response to collapsing demand as a result of the economic slowdown. The group may hold an emergency meeting before its next scheduled gathering in March, Venezuelan Energy Minister Rafael Ramirez said yesterday. OPEC President Chakib Khelil said four days ago that OPEC may meet in Kuwait City on Jan. 19 to discuss further production cuts, adding that OPEC will continue to reduce supply as demand falls until an “equilibrium” is reached. Brent crude oil for February settlement declined $1.09, or 2.6 percent, to $40.36 a barrel on London’s ICE Futures Europe exchange. Dec. 24 (Bloomberg) -- The yen traded near a one-week low versus the dollar as a drop in a gauge of currency swings increased the appeal of purchasing higher-yielding assets at the expense of the Japanese currency. The yen declined against the euro, the Brazilian real and the Canadian dollar yesterday on speculation some investors returned to carry trades. Britain’s pound approached the record low against the euro as reports showed the economy shrank more than originally projected in the third quarter and mortgage-loan approvals slumped. “We have a slightly better tone for buying the dollar- yen,” said Matthew Kassel, director of proprietary trading at ING Financial Markets LLC in New York. The yen traded at 90.97 per dollar at 7:03 a.m. in Tokyo, after falling 0.8 percent yesterday when it touched 90.92, the weakest level since Dec. 15. The yen has declined from a 13-year high of 87.14 set on Dec. 17. The Japanese currency was at 126.64 per euro, following a 0.7 percent decline yesterday. The dollar was little changed at $1.3922 per euro. It dropped to $1.4719 on Dec. 18, the weakest level since Sept. 25. The pound declined 0.8 percent to 94.77 pence per euro yesterday as the U.K.’s Office for National Statistics said the economy shrank 0.6 percent in the third quarter, the most since 1990. It fell to 95.57 pence on Dec. 18, the all-time low since the 15-nation European currency’s debut in 1999. The pound has lost almost a quarter of its value against the currencies of the U.K.’s biggest trade partners this year, according to the Bank of England’s effective exchange rate. Sterling may weaken to parity with the euro for the first time as early as next week, according to Bank of New York Mellon Corp. The yen depreciated 1.2 percent to 38.16 against the Brazilian real yesterday and fell 0.9 percent to 74.55 versus the Canadian dollar on increased demand for carry trade where investors sell the low-yielding currencies and use the proceeds to buy higher-yielding assets. The Bank of Japan cut its benchmark interest rate last week to 0.1 percent from 0.3 percent. Brazil’s main rate is 13.75 percent and Canada’s rate is 1.5 percent. Implied volatility on one-month euro-yen options touched 22.29 percent yesterday, the lowest level since Oct. 21. Lower volatility increases the appeal of carry trades by making profit from interest-rate differentials more predictable. The Japanese yen has gained 23 percent against the dollar this year, heading for its largest annual increase in more than two decades amid speculation the credit crisis will deepen. It rose 28 percent against the euro and 66 percent versus the pound. “I can see the yen coming off the highs as the market moves away from extreme risk-averse tones,” said Mark Frey, head trader in Victoria, British Columbia, at Custom House, a currency brokerage with 50,000 corporate accounts. The U.S. dollar fluctuated between a loss and a gain yesterday, as investors balanced their trading positions before year-end, said Dustin Reid, director of currency strategy at RBS Global Banking & Markets in Chicago. The dollar fell to a three-month low versus the euro last week as the Federal Reserve cut the target lending rate to between zero and 0.25 percent from 1 percent, and said it may keep rates low for “some time” while considering potential benefits of buying longer-term Treasury securities. “In the short term, we’ve found the equilibrium,” said Sebastien Galy, a currency strategist at BNP Paribas Securities SA in New York. “Eventually, the European economy will have more trouble. There’s a motive to sell the euro when the New Year begins.” The dollar may rise to $1.30 per euro in the next few months, according to Galy. For the year, the dollar strengthened 4.1 percent against the euro, 34 percent versus the British pound and 28 percent against the Australian dollar as investors sold riskier assets and repay dollar-denominated loans. FKLI December contract close marginally 3 points higher at 877as compare with previous trading session with a total of 7221 lots traded inthe market. 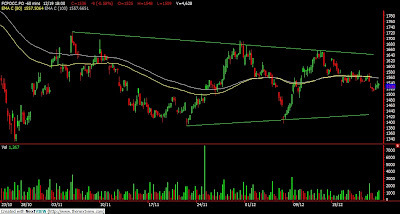 FKLI was opened and traded lower during earlier trading session but manage to recover partially due to some short covering activities before the end of the trading session. Technically, FKLI seems manage to hold well above 61.8% Fibonacci retrace figure at 865 region after massive sell down from 897.5 levels. 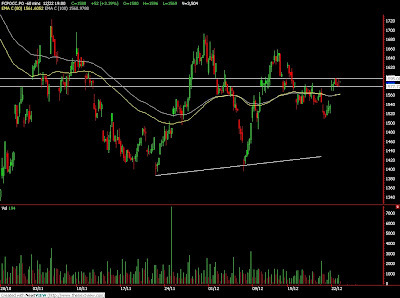 However,we expect FKLI would traded higher in the coming trading session provided support levels at 866 and 852 region were not violated. Traders were advice to hold long position in the coming trading session while region cautious around the resistance levels at 880 and 893 region. levels at RM1450 and RM1400 levels were not violated. Traders were advice to hold long position around the support region while being cautious around resistance levels at RM1560 and RM1600 region. Dec. 22 (Bloomberg) -- Gold rose, halting a two-session slide, as a decline in the dollar revived the appeal of the precious metal as an alternative investment. Silver was little changed. The dollar dropped as much as 1.2 percent against a weighted basket of six major currencies following a 3 percent gain in the previous two sessions. Gold’s rebound from a 13- month low in October has left the metal up 1.1 percent for the year and heading for an eighth straight annual gain. Gold futures for February delivery rose $9.80, or 1.2 percent, to $847.20 an ounce on the New York Mercantile Exchange’s Comex division. The metal gained 11 percent in the previous two weeks. Silver futures for March delivery rose 1 cent to $10.86 an ounce. The metal has dropped 27 percent this year. Investment in the SPDR Gold Trust, the biggest exchange- traded fund backed by bullion, rose to a record 775.3 metric tons last week. The Federal Reserve cut its benchmark interest rate to the lowest ever on Dec. 16, to between zero and 0.25 percent, in a bid to revive the economy. Gold reached a record $1,033.90 on March 17 as rate cuts sent the dollar to an all-time low against the euro in July. The federal-funds rate was at 5.25 percent in September 2007 when policy makers began cutting their benchmark as the economy headed into a recession. Gold is the fourth-best performer on the Reuters/Jefferies CRB Index of 19 raw materials this year behind cocoa, hogs and sugar. The Standard & Poor’s 500 Index has dropped 41 percent in 2008. Gold may finish the year around $850, Societe Generale said in a report on Dec. 19. The metal faces selling around $915 and support around $800, the bank said. Dec. 23 (Bloomberg) -- Crude oil fell for a second day on speculation OPEC will be unable to boost prices as the global recession curbs demand faster than the group can cut production. The Organization of Petroleum Exporting Countries is ``determined'' to stabilize oil markets, Saudi Oil Minister Ali al-Naimi told reporters in Doha, Qatar, Dec. 21. Japanese crude- oil imports tumbled 17 percent to 3.71 million barrels a day last month, according to a report from the country's finance ministry. Crude oil for February delivery fell 25 cents, or 0.6 percent, to $39.66 a barrel at 10:19 a.m. Sydney time on the New York Mercantile Exchange. Prices have dropped 73 percent from a record $147.27 on July 11. Yesterday, futures lost $2.45, or 5.8 percent, to $39.91 a barrel. All members of OPEC share the goal of stabilizing the oil market, Naimi told reporters at a conference in Doha. Kuwaiti Oil Minister Mohammed al-Olaim, speaking at the same conference, said he is ``confident'' of meeting production-quota cuts, adding that the oil price drop is caused by market conditions. Oil and energy ministers from the six Gulf Cooperation Council countries met in the Qatari capital. Saudi Arabia, Kuwait, Qatar, and the United Arab Emirates are also members of OPEC. The Gulf Cooperation Council's other two members are Oman and Bahrain. One of Japan's Asian neighbors, South Korea, also saw demand decline. Consumption dropped 12.4 percent in November from a year earlier. The country used 60.3 million barrels of refined products, data from state-run Korea National Oil Corp. showed yesterday. ``OPEC may be determined to stabilize oil prices, but with such poor demand it's hard to see how any supply-driven initiatives can have a positive impact on prices,'' said Addison Armstrong, director of market research for Tradition Energy in Stamford, Connecticut. Japan is the world's third-biggest oil importer after the U.S. and Germany, according to the U.S. Energy Department. South Korea is the fifth-biggest importer. Falling demand for raw materials has hit most commodity markets. The Reuters/Jefferies CRB Index of 19 raw materials declined 1.6 percent to 215.35. The gauge lost 55 percent since reaching a record in July. Brent crude oil for February settlement declined $2.55, or 5.8 percent, to settle at $41.45 a barrel on London's ICE Futures Europe exchange. U.S. supplies climbed in 11 of the past 12 weekly reports from the Energy Department as consumption dropped. Inventories probably rose 900,000 barrels last week, according to the median of analyst responses in a Bloomberg News survey. The department is scheduled to release its next report at 10:35 a.m. tomorrow in Washington. January futures, which expired last week, plunged 6.5 percent to $33.87 a barrel on Dec. 19, the lowest settlement for a contract closest to expiration since Feb. 10, 2004. Oil is down 27 percent in December. Iraq said that international companies bidding for the country's oil resources haven't been deterred by the slump in crude prices or the lack of a national petroleum law. The country had the world's fourth-biggest oil reserves in 2007, according to U.S. Energy Department data. Iraq's first licensing round since the U.S.-led invasion in 2003 is ``on course,'' and the country will proceed with another two rounds shortly, Oil Minister Hussain al-Shahristani said in a Dec. 19 television interview. Thirty-five companies are competing in the first round, due to be completed in June. Bets that February oil will rise above $55 a barrel were the most-active options in electronic trading on the Nymex yesterday. February $55 call options fell 38 cents to 45 cents a barrel, or $450 a contract, on volume of 415 lots. One contract is for 1,000 barrels of oil. Dec. 23 (Bloomberg) -- The dollar fell for a second day against the euro before U.S. reports today that economists estimate will show sales of new and existing homes approached the lowest level in at least nine years in November. The yen may strengthen versus the Australian and New Zealand dollars on speculation a global recession will spur interest-rate cuts in the South Pacific nations, eroding their yield advantage. The ruble slid to the lowest level against the dollar in almost three years as Russia devalued the currency and tumbling oil prices battered its economy. The dollar declined to $1.3978 per euro at 10:11 a.m. in Tokyo from $1.3944 late in New York yesterday. It slid to $1.4719 on Dec. 18, the weakest level since Sept. 25. The yen was quoted at 126.08 per euro following a 1.3 percent decline yesterday. It traded at 90.19 per dollar after falling 1 percent. The currency reached a 13-year high of 87.14 on Dec. 17. The dollar was little changed at $1.4830 versus the British pound and at 1.0932 against the Swiss franc. Commonwealth Bank now predicts the dollar will decline to $1.4200 per euro on March 31, compared with its previous forecast of $1.1800. Against the yen, Australia’s dollar was quoted at 61.65 from 61.70 and New Zealand’s dollar traded at 51.70 from 51.65 late in New York yesterday. Currency trading may be more subdued than usual because of Japan’s public holiday, Capurso said. The ruble traded at 28.3979 against the dollar from 28.4763 yesterday. It earlier reached 28.5140, the lowest level since January 2006, after a central bank official who declined to be identified said yesterday Bank Rossii allowed the currency to decline for the second time in three working days. The currency has slid 17 percent since the beginning of August. Home resales in the U.S. fell 1 percent last month to an annual pace of 4.93 million in November, according to a Bloomberg survey of economists. The National Association of Realtors releases the report at 10 a.m. in Washington. New-home sales dropped to an annual pace of 415,000, from 433,000, a separate survey shows. The Commerce Department releases that data at 10 a.m.
For the year, the dollar strengthened 4.4 percent against the euro, 34 percent versus the British pound and 28 percent against the Australian dollar as investors bought the greenback to flee riskier assets and repay dollar-denominated loans from lenders reining in credit. The yen may extend this year’s 24 percent advance against the dollar, its biggest annual gain since 1987, on concern a deepening U.S. recession will convince investors to avoid buying higher-yielding assets. Japan’s benchmark interest rate is 0.1 percent, compared with 4.25 percent in Australia and 5 percent in New Zealand. The yen may strengthen to 85 against the dollar in one month, Callow forecast. A stronger yen contributed to a record 27 percent drop in Japan’s exports in November from a year earlier, a Finance Ministry report showed yesterday. Toyota Motor Corp., the world’s second-largest automaker, yesterday forecast its first operating loss in 71 years because of plunging sales and a surging yen. FCPO 3rd month March Futures contract surge RM52 higher to close RM1588 as compare to previous trading session with 3504 lots traded in the market. CPO price was opened higher due to weak crude oil and soybean oil trading strong during trading session. Technically, CPO price mainly sideways within RM1577 ant RM1595 throughout the entire trading session. CPO price seems encounter some great resistance around 61.8% Fibonacci rebound level at RM1597 region. Again, we expect CPO price would remain traded sideways in the coming trading session. However, we still advice traders to hold long position in the coming trading session. Support was seen at RM 1540 region. FKLI December futures contract plunge 11.5 points higher as compare previous trading session to close at 874 with total of 7471 lots traded in the market. FKLI was opened higher during the trading session but later plunge during the trading session as news released query regarding fund on the bailout plan. Technically, FKLI plunge after topped around 38.1% Fibonacci projection at 896 regions. 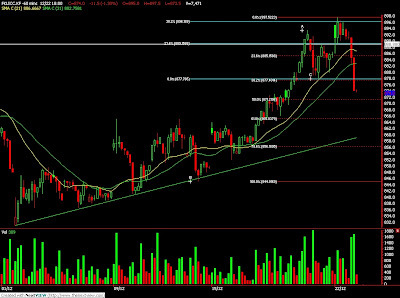 We expect FKLI would meet some support around 870 and 865 region; both 50% and 61.8% Fibonacci retrace figure. Traders were advice to hold long position in the coming trading session provided if the support levels were not violated. 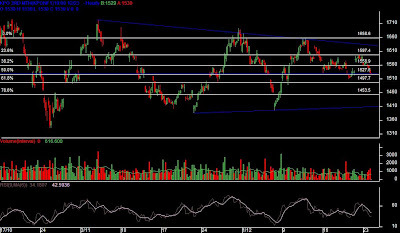 Resistances were seena t 877 and 886 levels. Dec. 22 (Bloomberg) -- The yen fell on speculation $13.4 billion in emergency government loans to General Motors Corp. and Chrysler LLC will give investors confidence to add to holdings of higher-yielding assets financed in Japan. The currency also declined against the euro on the prospect that Bank of Japan Governor Masaaki Shirakawa will say in a speech today that the yen’s 25 percent gain against the dollar this year is harming Japanese exports. The dollar also weakened against the euro before data this week that may show U.S. consumer spending, home sales and durable goods orders fell as the recession deepened. The yen declined to 89.77 against the dollar at 9:30 a.m. in Tokyo from 89.31 late in New York on Dec. 19. It also dropped to 125.76 per euro from 124.22. The euro was quoted at $1.4016 from $1.3912. The dollar slid to an 11-week low of $1.4719 on Dec. 18. Against the greenback, the Australian dollar rose 0.2 percent to 68.24 U.S. cents and the New Zealand dollar climbed 0.7 percent to 57.84 cents from late in New York. The British pound advanced 0.4 percent to $1.4976. Japan’s benchmark interest rate is 0.1 percent, which compares with 2.5 percent in the 15-nation euro region, 4.25 percent in Australia and 5 percent in New Zealand. In a carry trade, investors get funds in a country with low borrowing costs and invest in one with higher interest rates, earning the spread between the borrowing and lending rate. The risk is that currency market moves erase those profits. Another $4 billion will be available to GM in February provided Congress releases the second half of the $700 billion Troubled Asset Relief Program fund originally set up to bail out financial institutions. The automakers have until March 31 to meet conditions on the loans, including demonstrating they have a plan to become profitable, or be forced to repay them. GM, the biggest U.S. automaker, and No. 3 Chrysler have said they would run out of money as soon as this month if they didn’t receive the funds. KUALA LUMPUR, Dec 22 (Reuters) - Malaysia may raise its stake in government-linked firms as falling share prices make it cheaper to buy up stock of companies with long-term value, Deputy Prime Minister Najib Razak was quoted on Monday as saying. The government would not cut its holdings in state-linked companies until market conditions improve, Najib, who is also Finance Minister, was reported as saying by the Malaysian Reserve. Malaysia had earlier promised a gradual sale of state equity once it reforms state-linked firms to boost market liquidity. But progress has been modest, leading foreign investors to complain about market illiquidity. "It's not a good time to sell down anything. We will not get a good value yet," Najib said. "But it's a good time to increase your stake in companies that have long-term value. EPF (Employees Provident Fund) is in a position to increase its stakes and is looking at some good long-term investment potential." The government holds stakes in some of Malaysia's largest companies such as top lender Malayan Banking (MBBM.KL) and power firm Tenaga Nasional (TENA.KL). The Malaysian stock market .KLSE has lost about 40 percent this year, roughly in line with the performance of most regional markets. Najib also said the government would work with neighbouring Indonesia to stabilise the price of crude palm oil. The two countries control about 90 percent of the palm oil output, he said. "I see this (falling commodity prices) as a temporary aberration rather than something continuing in the medium term," he said. "So I expect the price of petrol to go up and palm oil to go up again." Dec. 19 (Bloomberg) -- OPEC may meet in Kuwait City on Jan. 19 to discuss further production cuts, according to Chakib Khelil, the president of the group. The Organization of Petroleum Exporting Countries will continue reducing output as demand falls, Khelil said in an interview today. The potential “special” meeting, which may coincide with a meeting of Middle East heads of state, could allow oil producers to share views of the market after the cartel, which pumps 40 percent of the world’s oil, agreed on Dec. 17 to cut output by 2.46 million barrels a day starting on Jan. 1. Prices have slumped 37 percent this month. Crude oil for January delivery fell 76 cents, or 2.1 percent, to $35.46 a barrel at 10:51 a.m. on the New York Mercantile Exchange. Futures touched $33.44, the lowest since April 2004. The January contract expires today. The more-active February contract rose 72 cents, or 1.7 percent, to $42.39. Dec. 22 (Bloomberg) -- Crude oil rose a second day in New York on speculation OPEC production cuts and economic stimulus plans will slow rising global stockpiles. The Organization of Petroleum Exporting Countries is “determined” to stabilize oil markets, Saudi Oil Minister Ali al-Naimi said in Doha, Qatar, yesterday. U.S. President-elect Barack Obama is broadening a package of measures to create 3 million jobs in the U.S., the world’s largest economy, during the next two years, an aide said Dec. 20. Crude oil for February delivery rose as much as 72 cents, or 1.7 percent, to $43.08 a barrel in after-hours electronic trading on the New York Mercantile Exchange. It was at $42.94 at 10:07 a.m. in Sydney. The contract rose 69 cents, or 1.7 percent, to $42.36 on Dec. 19, its first gain in six days, and lost 14 percent last week. Oil, metal and equity prices rose that day after the U.S. agreed to extend $13.4 billion in emergency loans to keep General Motors Corp. and Chrysler LLC operating amid a slump in global demand. Brent crude oil for February settlement was untraded on London’s ICE Futures Europe exchange today. It rose 1.5 percent to $44 on Dec. 19. New York oil futures have fallen 71 percent from the record $147.27 a barrel reached on July 11. The January contract, which expired last week, plunged 6.5 percent to $33.87 a barrel on Dec. 19, the lowest settlement since Feb. 10, 2004. It dropped 27 percent last week as stockpiles at Cushing, Oklahoma, jumped to a 19-month high and investors quit the contract before the holiday break. Hedge-fund managers and other large speculators last week increased their bets on rising oil prices to the most in seven months, according to U.S. Commodity Futures Trading Commission data. Net-long positions, the difference between orders to buy and sell the commodity, increased more than fivefold to 64,120 contracts on Dec. 16, the commission said last week. Dec. 22 (Bloomberg) -- Gold may rise for the third straight week on speculation the dollar’s rally will stall, boosting the appeal of the precious metal. Thirteen of 25 traders, investors and analysts surveyed from Mumbai to Chicago on Dec. 18 and Dec. 19 advised buying gold, which rose 2.1 percent last week to $837.40 an ounce in New York. Seven said to sell, and five were neutral. The Federal Reserve on Dec. 16 cut its benchmark interest rate to zero to 0.25 percent from 1 percent, driving the dollar lower. Gold reached a record $1,033.90 in March, partly because of a decline in borrowing costs. Most analysts surveyed on Dec. 11 and Dec. 12 anticipated gold’s gains last week. The survey has forecast prices accurately in 143 of 242 weeks, or 59 percent of the time. Dec. 19 (Bloomberg) -- The Japanese yen will continue to strengthen next year as deleveraging by financial institutions decreases risk taking even as markets become more stable, according to Citigroup Inc.
Investors should sell the dollar and buy the yen in 2009 as U.S. monetary and fiscal policies make U.S. assets less attractive, Citigroup strategists led by Jim McCormick, London- based global head of foreign exchange and local-markets strategy, wrote in a research note today. The yen has been the biggest gainer this year, climbing at least 15 percent against all major currencies, as investors sold risky assets to pay back low-cost loans in Japan’s currency. The yen appreciated 25 percent against the dollar this year, the most since 1987. The dollar fell 4.4 percent against the euro this week as the Federal Reserve cut its target lending rate to a range of zero to 0.25 percent and reiterated plans to purchase agency debt and mortgage-backed securities. Citigroup also recommended investors sell the ICE Dollar Index, which tracks the greenback against the euro, the yen, the pound, the Canadian dollar, the Swiss franc and Sweden’s krona. Citigroup said commodity currencies have good relative value and suggested buying the Australian dollar against the New Zealand dollar. FCPO February futures contract close marginally RM9 lower as compare to previous trading session at RM1536 with a total of 4628 lots traded in the market. CPO price was mainly traded within RM1540 to RM1510 region throughout the whole trading session as crude oil and soybean oil were moving volatile without certain direction. 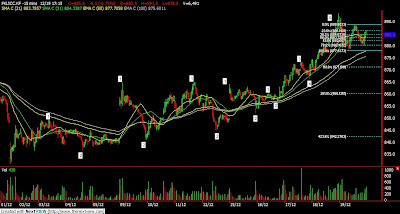 Technically, CPO price manage to cover gap from the previous trading session after opened lower during trading session. 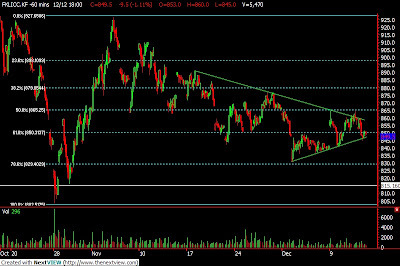 CPO price was seen breakdown from descending triangle support line at RM1540 while manage to test the next support level at RM1527 region. As from our previous commentary, we expect CPO price would trade lower to test support levels at RM1490; 61.8% Fibonacci retracement figure and RM1430 region before starts to traded higher again. Traders were advice to hold short position for short term trading around being cautious around the resistance levels at RM1580 and RM1620 region. FKLI December futures contract closed 6.5 points lower compare to previous trading session at 885.5 with 6491 lots were traded in the market. FKLI was traded mainly downwards during the trading session as most of the regional indices were traded lower due to some profit taking activities. Technically, FKLI seems to temporary supported above 877, 38.1% Fibonacci retracement figures while likely to forms a symmetric triangle in the 15 minutes price chart. However, we remain to expect FKLI would trade higher in the coming trading session provided support levels at 860 and 842 were not violated. Traders were advice to hold long position in the coming trading session while be cautious around the resistance levels at 888 and 907 region.